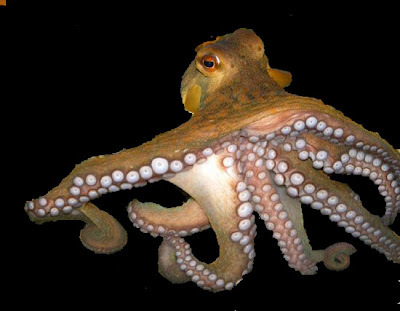 Octopuses often equated with the squid, but the difference is quite striking. At first glance, like an octopus only has legs (tentacles) and head. While squid appear to have part of a larger body than the head and tentacles. Currently octopus the easier it is found in seafood marketing, tickling fans to try the cooking process. In order not to confuse what to do with the octopus, Woman give the following tips. The initial part is usually confusing is how clean the octopus. With its rounded intact, as if the octopus does not have access to clean. Yes, indeed you have to cut it first. Turn the octopus and cut to form a hole in the middle of where the tentacles meet. Next remove the ink sac and internal organs of the octopus. Do not be afraid to bother, because this octopus shaped organ in a pocket and has fragmented so it is easy to clean. Next live octopus rinse under running water. Do not skinned it first because it does not like squid, octopus outer layer is more easily cleaned when ripe. So now enter the octopus boil the water and when water is boiling. Make sure the water soak the whole octopus, if the water is reduced add more water to cover the octopus. Add the spices in the cooking water to make it more delicious octopus. Boil until tender octopus. You can test it by piercing the thick tentacles using a fork. Cooked octopus meat will easily punctured. Unlike other seafood are the longer it will be increasingly hard boiled, octopus takes about 20 minutes to 1 hour to make it tender. Boil for five minutes it will produce a rather tough meat. Once cooked, rinse octopus with cold running water. Then you can peel the outer skin with ease. Once exfoliated, you are free to cook it according to your choice of octopus recipes.